Eco-chic customizable holiday cards. Cards are printed on paper stock derived from 60% recycled pre-consumer waste pulp with the remaining 40% from sustainable managed tree plantations. Vegetable based inks. Printed in USA by an FSC (Forest Stewardship Council) certified facility.Plain Jane's Season's Greenings. Made from 100% natural ingredients including organically grown and wildcrafted herbs and aromatic essential plant oils and unrefined butters and beeswax, this wonderful skin care line is whipped up (literally!) by herbalist Eve Stahl. Custom formulations available. Garden of Eve. This Body Souffle comes in four "flavors". I tried the luscious Mango Souffle and it was absolutely heavenly. Not only does it smell fabulous, the combination of shea butter and mango butters plus avocado and sweet almond oils does wonders for dry winter skin (even feet!). 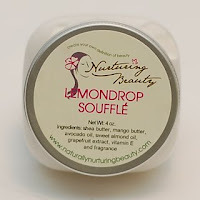 Shea and mango butters are solid at room temperature but melt when they come into contact with your skin. Now that's a scrumptious beauty treat! Nurturing Beauty. 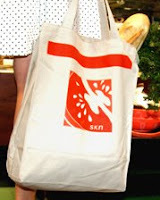 Last but not least, here is one of our favorite bags (tomato design shown here). Whether it's a trip to the farmer's market, bodega, or corner store, these tote bags are durable and practical, yet hip. Organic cotton. Made in the USA. Choose your fruit or veggie. 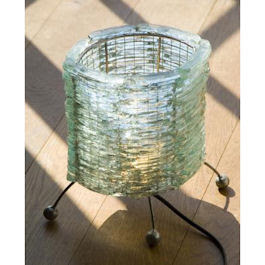 Simply called a "glass lamp", it's made from pieces of small glass left over from glass workshops in India. Fairtrade, Made in Indonesia. 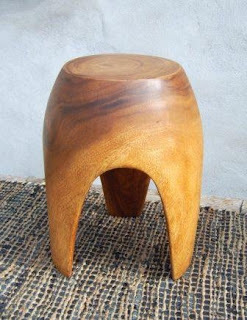 This super cool stool is made from monkey pod wood, an extremely dense, sustainable fast growing wood. The wood is termite proof and naturally water resistant so it can be used outdoors as well as inside the house. The Eco-Smart Vision is a fireplace I can relate to. A piece of "smart" eco-friendly furniture with clean lines, and no mess or fuss. what's really cool is that you can place this fireplace wherever you choose. Rectangular in shape with a flueless burner fuelled by denatured ethanol. Height: 990mm Width: 1190mm Depth: 536mm. 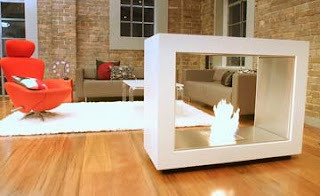 Compact Eco-Smart Fusion fireplace also available for smaller spaces. 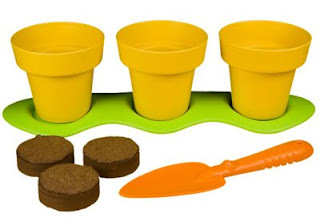 This kid-friendly gardening kit is made from recycled plastic milk containers. No phthalates or BPA to worry about plus it's eco-friendly! Contains 3 bright yellow flower pots, apple green tray, orange trowel, soil pellets, three organic seed packets, and planting instructions. Ages 5+.